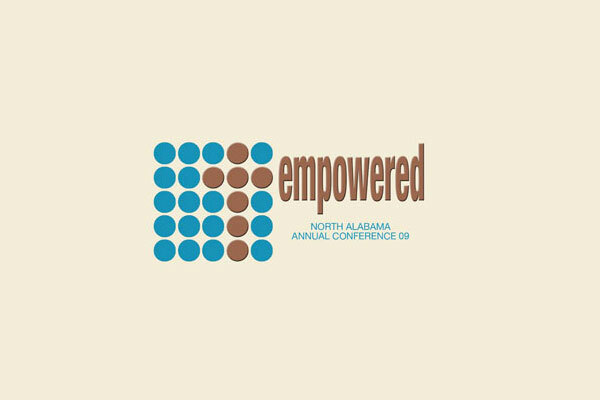 Click here to download your 2009 North Alabama Conference Journal from the online Journal Library. The first clergy and lay members and visitors to the 2009 North Alabama Annual Conference began to gather on the campus of ClearBranch United Methodist Church at noon on Thursday, June 4 for the family picnic. Methodists of all ages enjoyed the picnic time as a chance to visit with old friends and to begin to make new friends. The youngest Methodists in the crowd also got to enjoy fun activities such as a story teller, a bouncy castle, face-painting, putt putt golf and other games. An afternoon shower didn’t dampen the fun. During the afternoon Mission agencies and other ministries opened their displays for members to visit and learn. At 4 p.m. several hundred members gathered in the Worship Center for the Constitutional Amendments discussion. This year each United Methodist Annual Conference will vote on 32 Amendments to the United Methodist constitution proposed by the 2008 General Conference. The afternoon discussion was a time for members to ask questions, share their opinions and hear the thoughts of other. Annual Conference full clergy and lay members will vote on the Amendments Friday afternoon. Thursday ended as North Alabama United Methodists gathered at Huffman UMC for the annual Memorial Service during which they remembered the clergy and clergy spouses who have died since last Annual Conference. Dr. Mickey Morgan gave a sermon titled Passing on to a New Generation. Bishop Willimon led an Act of Remembrance during which the name of each person being remembered was called. Rev. J. Duncan Hunter, Jr.
As United Methodist from throughout North Alabama gathered for the 140th session of the North Alabama Conference on Friday, June 5, the morning began with opening worship. Following Opening Worship Bishop Will Willimon called the Conference to Order. The Clergy then went into the Clergy Session to conduct official clergy business and Lay members went into the Lay Orientation Session where they heard a presentation on Natural Church Development (one of the Conference priorities) from Dr. Jack Stephenson. This is the only time during Annual Conference clergy and laity work separately. After a time for lunch and fellowship the afternoon session began with the handing out of ballots and discussion on the 32 United Methodist Constitutional Amendments lay members and full-connection clergy from every Annual Conference in the world will vote on during their 2009 sessions. The Conference then began hearing reports. First they heard a report on the Central Conference Pension Initiative. Led by Dr. Neal Berte, the Conference heard about the effort the United Methodist Church is making to raise $20 million to help fund pensions for clergy who have served in Central Conferences around the world and have not pension system. The Conference hear why this initiative is important from Dr. Thomas Muhomba, originally from Zimbabwe who share stories of his experience in that Conference. Dan O’Neill from the General Board of Pensions explained how this CCPI program will be administered. Finally the Conference heard testimonies from two North Alabama Conference pastors whose church’s have made pledges to this effort -- Rev. Sam Huffstutler from Arab First Church and Dr. Ken Dunivant from Tuscaloosa First. The Conference then heard the report of the Lay Ministry Team. The report began with the Conference electing the new District Lay Leaders for the year. Then Conference Lay Leader Ellen Harris presented the Laity Address. She remembered the influence of others, including her grandfather, and how their faith story shaped her faith. She encouraged each Conference member to continue to share with the next generation their faith. The Conference then heard the report from the Board of Higher Education and Campus Ministry. First the Conference heard reports from Dr. Cam West, President of Huntingdon College and Dr. David Pollick, President of Birmingham-Southern College. The presidents shared the state of the two United Methodist related colleges and how each is helping a new generation of students be in ministry with the church. Then each of the campus ministers in the North Alabama Conference were recognized and a video of testimonies of current college students describing what campus ministry has meant to them was shown. The Conference then heard the report from the Office of Connectional Ministries. The report focused on the four Conference priorities - new congregations, Natural Church Development, Effective Leadership for the 21st Century, and Empowering a New Generation. A number of people spoke about how ministries of the Conference have helped them and their local church focus on these priorities. Then new Connectional Ministries staff member Rev. Matt Lacey and Missions Team Convenor Rev. Carrie Kramer Vasa introduced the new fifth Conference priority of Missions. Their presentation laid out the theological reasoning and the goals for this new priority. The Conference then heard from the Conference Finance Team and voted to adopt the 2010 budget of $10,856, 843. This budget is a reduction of $5000 from the 2009 budget. Conference Treasurer Scott Selman also announced that in 2008 the Conference saw an increase of 7 churches who paid 100% of their connectional givings. That meant 494 churches were 100% churches in 2008. The Conference then head the report from Pensions and Health Benefits. The Conference approved the 2010 premium costs. The team reported that although, this is an increase from 2009, the North Alabama Conference will be seeing the smallest increase of all United Methodist Conferences on the HealthFlex plan. The Conference then heard a report from Sumatanga. Executive Director Rev. Bob Murray presented an honest up-front report about the finances crisis the camp and conference center is now facing. He noted that the biggest help to Sumatange would be for churches to make more use of the camp and have more overnight events there. He concluded noting it is up to Conferece churches to make the decision “if Sumatanga is relevant” today. Following the report Bishop Willimon commented that Sumatanga is indeed in the worst crisis in its history. He noted that the Trustees are currently working on a comprehensive plan and a new plan of organization. This plan will be presented in July. After Dr. Mickey Morgan request more information as to the camp finances, Rev. Murray reported that the camp is currently in debt about $900,000 and currently is running about $300,000 a year behind in revenue for its usage. Following this report a passionate discussion from the floor began. Dr. Glenn Conner made a motion that eventually was amended to be that every North Alabama congregation should take a special offering (a sacrifical offering) within the next two months for Sumatanga. During the discussion Rev. Charles Lee made a public challenge to try to find 100 people here at Annual Conference that will give $1000 immediately to camp. Many people stood as a pledge to do so. The Conference then paused for a special tradition where one of the retirees presents a bible to a member of the new class of ordinands. Dr. Mickey Morgan presented the Bible to Rev. Teddy Crum. During the next year each member of the Ordination class will have an opportunity to use the Bible to preach. The afternoon session then concluded with a moment of silence and prayer led by Bishop Willimon to remember those clergy and clergy spouses who were memorialized the night before during the annual Memorial Service. Friday concluded with a high time of worship as the Conference celebrated with the Service of Ordination. During this service 14 new deacons and elders in full connection were ordained. Bishop Willimon preached a sermon titled “Be Young.” Following their ordination, the new deacons and elders were presented stoles by the retiring class of clergy and then joined with members of the Cabinet and Board of Ordained Ministry to serve communion. Saturday morning of the North Alabama Conference began with a morning multi-cultural communion service. Litanies and prayers were said in different languages. Even different types of breads were used to represent the cultures of United Methodist Christians throughout the world. Children who were a part in the Annual Conference Camp for Kids participated through song and helping to serve communion. Following the time of worship, Conference Secretary Sherrill Clontz reported the North Alabama votes on the 32 United Methodist Constitutional Amendments. These votes will be sent to the General Church and the votes will be added to all other votes from all other Annual Conferences throughout the world. For any amendment to be ratified it must be passed by a 2/3 vote of all these total votes. Director of Connectional Ministries Rev. Dale Cohen then presented the Nominations Team report. It was passed as proposed. Rev. Cohen then announced that on Friday the Conference raised more than $62,500 for Camp Sumatanga and more than $8900 for the Conference mission offering going to empower children in Zimbabwe through the Ishe Anesu Project. Bishop Willimon then noted we are closing four times as many churches as we are starting. He then introduced the Conference Statistician Rev. Lori Carden. Rev. Carden noted that the death rate for North Alabama United Methodists in 2008 was 8 % higher than the death rate for the state of Alabama. More than 2000 people were removed from church rolls by death. Total membership for the Conference decrease by 852 people. At the end of 2008 total membership was 149,473. Rev. Carden did bring some good news in noting some areas of growth. She noted in 2008 professions of faith increased by 401 people ; ethnic membership was up by 689 people and the number of people who were baptized in North Alabama United Methodist Churches was up by 115. She also noted a huge increase in the number of people participating in small groups – 8425 people! Bishop Willimon commented following this report the decrease in membership is the smallest North Alabama has had in at least a decade. He also noted that loss is due to members dying not members leaving our churches. He then introduced the new Director for the Center of Congregational Development Dr. Tommy Gray. Rev. Gray noted the importance of “new” things and new churches. He then introduced the 2009 Denman Award winners – Sherry Bassham and Rev. Melody Traylor, A video celebrating each woman’s ministry was then shared. Gloria Holt then spoke on behalf of the Episcopacy Committee. She presented Bishop Willimon and his wife Patsy with a painting of the United Methodist Center. The Conference then held another holy time of worship as it Commissioned new provisional deacons and elders in to membership in the Conference. Bishop Willimon preached using the story of the Call of Samuel. Following lunch Conference Secretary Rev. Sherill Clontz noted that with the offering received at the Commissioning Service, the total for the Conference Mission Offering was now over $12,400. Bishop Willimon then recognized Rev. Dorothy Ann Webster for a moment of personal privilege. She requested that Conference Secretary send a letter on behalf of the Annual Conference to the pastor and congregation of Woodlawn United Methodist Church whose church sanctuary was destroyed by fire last week. The Conference approved this letter of support and encouragement as the congregation enters into the recovery phase of this tragic loss. South Central District Lay Leader Bob Boyce then made a motion that in light of the passionate discussion and generous outpouring of financial support for Camp Sumatanga that the strategic report the Sumatanga Trustees are completing this summer be shared with the North Alabama Cabinet so the Conference can stay informed and encourage this plan of the Camp. The Conference then welcomed it’s next speaker to help local church empower a new generation of Christians. Dr. René Rochester, President of Urban S.E.T. Inc. (Strengthening, Educating and Training), gave a high energy presentation and shared her personal story while encouraging congregations to reach the new generations by going where they are, building relationships with them and teaching them what you know. Following a break that featured a reception for Bishop and Mrs. Willimon, the Conference welcomed its final set of speakers to help challenge and equip local churches to better reach a new generation of Christians. Eddie Hammett & Randy Pierce, authors of the book Reaching People Under 40 while Keeping People Over 60. During their presentation Eddie shared his story of how he, as a person raised in the church, learned to relate and share his faith with Randy who was a younger person with no church relationship. Eddie noted he had to learn that his comfort was not more important than reaching out to others. Randy noted it was Eddie’s authenticity that made him willing to enter into relationship with him and hear about his faith. The Conference then heard a brief presentation from Rachel Harvey from The Advance . She noted a new 24 hour food-fasting event called B1 targeting youth and young adults. This opportunity helps young people make connections and connect their lives to the poor. Bishop Willimon thanked Paulette West for her work in leading missions in the North Alabama Conference. West is the new Executive Director of the Southeastern Jurisdiction Volunteers in Mission. Before he called for a motion to adjourn, Bishop Willimon thanked ClearBranch UMC for their hospitality for the 2009 Annual Conference. Senior Pastor Robin Scott then issued and invitation for the 2010 Conference to beheld at ClearBranch. The invitation was accepted. Bishop Willimon then announced the 2010 Annual Conference will be at ClearBranch UMC June 3-5, 2010. After a motion to adjourn, the Conference moved into a time of worship. Music was lead by the band Rush of Fools who would lead a concert for youth and young adults from throughout the Annual Conference on Saturday night. Rev. Carrie Kramer Vasa then gave the sermon saying “God is calling us to Change the World.” She noted that being empowered does not come at a certain age, but it comes from the call from God we all receive. She then introduced three young adults who shared their story of being empowered by God and working to change the world. These include Rev. Bridget Cabrera, a campus minister; Maria Underwood, who share you experiences in global missions through Volunteers in Mission; and Nate Paulk, who spoke of those who helped empower him in Christian Service and his work with SIFAT. The Service ended by giving people a chance to express and interest in mission areas they would like to explore in order to help transform the world.